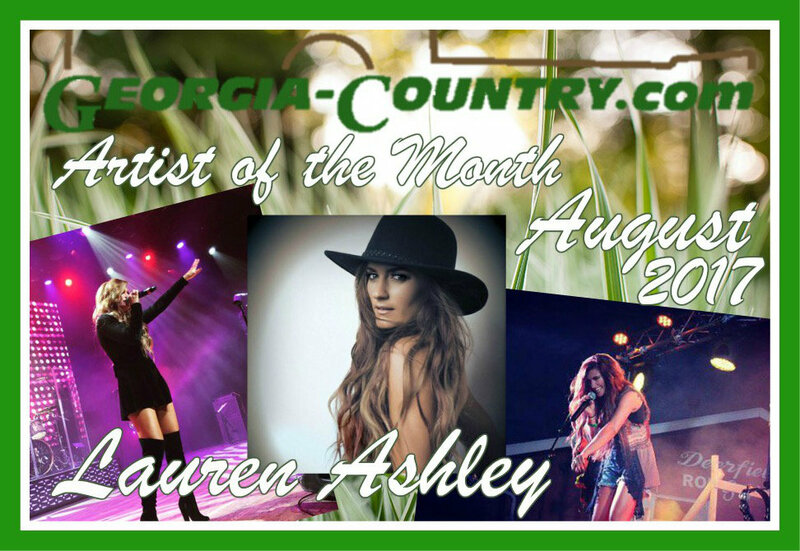 Our August Artist of the Month is Lauren Ashley. Read her interview below as GC catches up with a former Georgia Country Awards winner. Then check out her music in videos at bottom of page. GC: Lauren, lets get new fans caught up with you. Tell us where you were born, raised and now live? LA: Hey! Well, I was born and raised in Griffin, GA. Georgia will always have a special place in my heart, but for the past 6 1/2 years Nashville, TN. has become home to me and I absolutely love it!! GC: Who where your influences in country music or music in general at an early age? LA: Wow. I have a lot of artists who have influenced me and my music, but I would have to say a few would be (from the non-country world) Stevie Nicks and Steven Tyler... and then from the country world, Miranda Lambert and Eric Church.. just to name a few! GC: When and where was the first time you performed in front of an audience? LA: When I was a senior in high school I competed in a karaoke competition in Thomaston, GA. at the Ponderosa (will never forget that!!) so that was the first time I performed in front of an audience. But as far as a real, band show.. I was in college at Georgia Southern and performed at RumRunners! Was THE BEST TIME! GC: You are one of the very few REPEAT winners of the Georgia Country Awards. How did winning these effect your career? GC: You moved to Nashville a few years ago. Was there anything that pushed you to make that next move? LA: Well, my family was very supportive of me and my dream of being a country music artist.. and I think it is known that in order to REALLY pursue a country music career, Nashville is where you need to be! So, I packed up at the age of 19 and made the move! It wasn't easy but I knew that my dream was worth it! And so far, it has DEFINITELY been worth it! GC: What would be the biggest difference in being a "local" act in Georgia and one of many in Nashville? GC: Do you think there is still an "uphill climb" for females in country music? And if so, why? LA: I absolutely do. I have experienced it first hand. I think that there is a stigma about female artist that we can not sell out shows, sell beer, put on an energetic, fun show... put out great music that appeals to both men and women. However, I know that there are SO many females who can do all of the above! But it does require a lot of work and determination to get past the glass ceiling. I believe in proving your worth and greatness and eventually you will be at the top of that hill! Just have to keep grinding! GC: What is your favorite place to play in Nashville and why? LA: My favorite place to play in Nashville is definitely Wildhorse Saloon. We have been so lucky to have been given the opportunity to play Wildhorse many, many times over the last few years and I am so grateful! Wildhorse Saloon has the absolute best stage, light show, sound, etc in all of Nashville (outside of Bridgestone Arena and Ascend Amphitheater) It is the closest thing to a huge, major venue. SO that is definitely our favorite place to play! GC: How was the experience in make your video of "Rebel Child"? LA: It was so amazing! I worked with the greatest team on "Rebel Child"... Jukebox Romeos and House of Motion Cinematography! We shot the video in an office building most of the day, and then did the full band scene on the rooftop of a parking garage. It was a rather cold April evening when we shot the outside scene so that was definitely an experience! But overall it was amazing. We had the best crew, set of actors/actresses... and we just literally had the best time! I will never forget that day!! GC: What are you plans for the rest of 2017?